Eric’s fish and chips is in nestled in North Norfolk in the picturesque village of Thornham. At just over an hours drive from Norwich, I think it could be the first ‘destination chippie’. Plus there are tons of beautiful places to visit in this area, we were nearby at Wells beach this weekend but couldn’t resist the short drive to Eric’s. It’s simply decorated inside with a stripped back colourful look. The menu is kept simple too, which means that they pay plenty of attention to everything they do. Both times I’ve visited I’ve had the battered cod loin. The fish is the most succulent I’ve ever had, the batter crunchy and crispy. The gluten free batter is a thing of beauty… I had a look around and I think it actually looks better than the ’normal’ one. They use separate fryers so there’s no cross contamination. The chips are great too, crispy on the outside, soft on the inside. Letting you know which of the local spuds was used is a nice touch. Mushy peas and homemade tartare sauce are both excellent. An extra special mention has to go to the battered gherkins… I could just eat a plate of these! That same crunchy batter gives way to the acidic hit of the pickle and it just works brilliantly! There are so many dishes I want to try too but it’s hard to resist when the cod loin is so good. The squid and prawns both sound delicious, plus there are more unusual fish shop catches like gurnard and mackerel. My only niggle would be that we couldn’t take the dog in. As I said the décor is pretty minimalist so I wouldn’t see a well behaved dog causing a problem. In the summer though, there a tables outside which will be dog friendly but it was cold and raining this weekend. We saved her a little fish to make up for it. Even she was a fan of Eric’s cooking! I absolutely love this place and can’t wait to go back. In this final part we head out of San Francisco and on to Napa Valley for some wine tasting. We stayed in an Airbnb, which had a BBQ so we took the opportunity to eat in a couple of times. The local supermarket was well stocked and things like gluten free bread was readily available. I would definitely recommend the wine tasting experience at Gloria Ferrer! We took the 'Bubbles and Bites' package and got to sample an array of still and sparkling white wines with a few nibbles alongside. Our host was hugely entertaining, giving us a mix of information about the wines and gossip about the Ferrer family, weddings and other tales. The setting is stunning; overlooking the vineyard and to finish we were treated to another large glass of our favourite wine! We headed on to our next stop - Yosemite National Park. We stayed at a place called Tenaya Lodge on the outskirts of the park. It was great to be nestled in amongst the forest and wildlife and we did a trek to nearby waterfalls. The food was good and like most places in America, knowledgeable about gluten free. As it's the only place around, it was quite expensive, knowing it had a captive audience. Deep fried sprouts were again a highlight and dishes of salmon and steaks were well presented and tasty. During the day the bar served sandwiches on gluten free bread and I had a good club sandwich. After a stunning drive through the breath-taking Yosemite park, we headed for Death Valley. The contrast is incredible. We broke up the journey with a stop in a little town called Bishop where we'd heard about an amazing BBQ joint. It didn't disappoint, Holy Smoke did amazing BBQ meats including brisket, pulled pork, ribs and more. Nearly everything was gluten free and the staff were clued up. Sides of potato salad and slaw were nice accompaniments to the delicious slow cooked meat. On to Death Valley and we were treated to 120 degree heat and desert landscapes. Little did we know that we'd be caught in a rare storm! Half way through our meal at Furnace Creek the power went out leaving only a back up generator powering the kitchen and a couple of lights. Even worse, we now had no air conditioning in the restaurant or any of the rooms. I've never felt heat like it, even the wind brought by the storm was hot! The food included dates wrapped in bacon with blue cheese for starter, followed by a huge Tomahawk steak. My friend and I shared this but we were beaten, a combination of the sheer volume of meat and the heat was just too much. After very little sleep we were up and out early to escape the heat and headed on to Las Vegas. We stayed at the Hard Rock and this was definitely one of my favourite places. Really great corn tacos filled with things like re-fried beans, slow cooked pork and beef, and fresh salsas were delicious. Make sure you try the bacon wrapped jalapenos, stuffed with melting mozzarella as these were a real hit. We only had breakfast here but they do some awesome gluten free blueberry pancakes. The menu was clearly labelled and staff were knowledgeable. Washed down with some maple syrup they were a great way to start the day. If you fancy a gluten free Chinese then PF Changs is a chain that's always worth hunting down. With a dedicated gluten free menu they know what they are doing. We tucked in to delicious dishes including Chang's spicy chicken and Mongolian beef. I'm always a bit wary of buffets, they conjure up images of generic beige food but this was something else! The chef came and took me round the plethora of different stations. Most was gluten free so he just pointed out the things to avoid. Highlights were definitely the snow crab and the various sweet treats I could have. Worth adding on the all you can drink option too to stock up on cocktails! On our final night we headed to the older part of Vegas - Fremont street. We had a delicious steak dinner at Chart House. I had the crab to start, a mountain of fresh crab meat with a mango and avocado salad - delicious. We loved our American road trip and from a gluten free perspective it was easily one of the best places we've visited. It was always easy to get great food and the service and knowledge was brilliant. So only a few months since the last instalment... I've made a vow to get quicker at blogging, wish me luck! If anyone can tell me a quick way of getting photos from icloud to blogger, I'd appreciate it. This place was busy so we had a little wait but it was well worth it! It was referendum night in the UK and we were watching on with dread as news came through that we would no longer be EU citizens. Luckily amazing gluten free pizza was on the way! It was even fantastic cold the next day before going to a ball game. 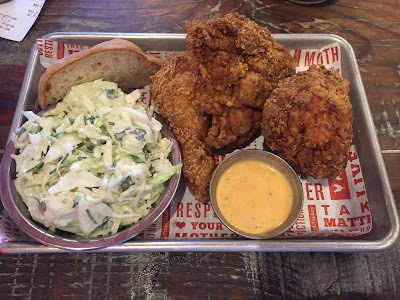 After spending the morning on Alacatraz, we headed to Pier 39 at Fisherman's Wharf for a bite to eat and found Fog Harbour Fish House. Fantastic seafood and very accommodating for gluten free too. Fresh oysters and crab and a tuna steak and prawns all beautifully cooked. Biking over the Golden Gate bridge was well worth it and at the other side is a fantastic town called Sausalito. We had some incredible mexican food at a place called Copita. Delicious gluten free tacos and the best guacamole I've ever had! For an all out American feast the pub is the place to go. We definitely over ordered, we should have paid more attention to the look our server gave us! Ribs, brisket, pulled pork - it's all about the BBQ. We started with some baked chicken wings and then all had duo's where you can pick 2 meats and 2 sides! San Fran really is a treat for gluten free eaters and no more so than Proposition Chicken. Crispy, crunchy, seasoned deep fried chicken of the sorts that coeliacs can usually only dream of! Go for a side of deep fried brussel sprouts too. Final night in San Fran and we headed out for a Thai meal. Tasty classic thai dishes were serve at Ben Thai Cafe and they were good at handling allergies. Next stop, on to Sonoma, Yosemite, Death Valley and Vegas! Earlier this summer my wife and I had an amazing break with our friends travelling around California and on to Las Vegas. We started in Los Angeles before travelling up the coastal road to Pismo Beach, Monterey Bay and on to San Francisco. After a few days in San Fran it was on to Sonoma, Yosemite National Park and Death Valley before ending our epic adventure in Vegas. It was an awesome holiday, from trekking the Hollywood Hills, to the amazing coastal drives, Alcatraz, wine tasting, waterfalls, the brutal heat of Death Valley, to pool parties and landing in the Grand Canyon for breakfast! But this blog is always about the food! Eating gluten free was easy, a bit of research to make sure there were plenty of options but everyone understood and had a good knowledge of what I could and couldn't have. So here's a whistle stop tour of some great gluten free places to eat. First stop was a classic American diner breakfast and Denny's has lots of gluten free options clearly marked on the menu. Be prepared for huge portions and refillable drinks. We ate at Denny's a couple of times for breakfast / brunch, I tried the Santa Fe Skillet - chorizo, potatoes, peppers and eggs and a Philly Cheesesteak Omelette with hash browns. Both very tasty, both absolutely massive. Another American institution with a lot of gluten free options on the menu. 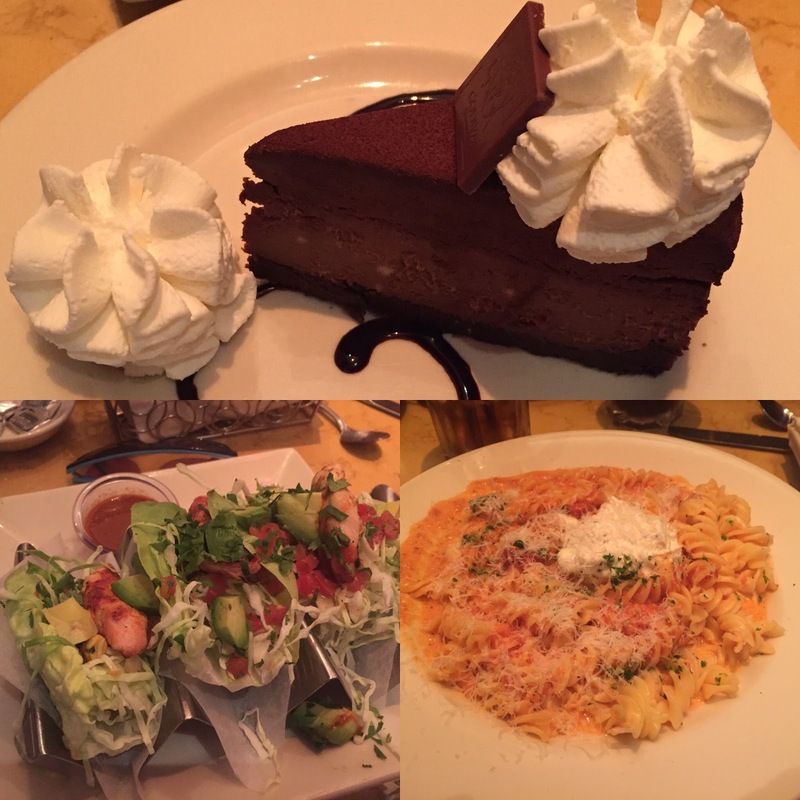 Tasty pasta dishes and burgers with gluten free bread buns and an epic gluten free cheesecake called Godiva. It's a huge portion of deliciously rich chocolate cheesecake - make sure you save room! A trendy Los Angeles restaurant that specialises in grilled meats. They were really knowledgeable about what I could have and there were lots of options or adaptations they could make. For starter, I had grilled squid which was filled with potato hash and a roasted tomato sauce. Squid was beautifully cooked with a nice char and the tomato sauce had a real depth of flavour. For main course I had tri-tip with a Bearnaise sauce and grilled broccoli. The tri-tip, a cut of sirloin was sensational and really showed off their grilling skills! Recommended by a friend as the best sandwiches in LA we had to try it! The place is an old Italian style deli and was packed with keen customers. The sandwiches were well worth the wait though. The gluten free ones are served on a delicious Italian style flat bread. I had the 'Godmother', an insane amount of Italian meats, provolone cheese, salad and peppers. Definitely one of the best sandwiches I've ever had. Great seafood restaurant overlooking Pismo beach. Succulent scallops were served with crispy Brussel sprouts and goats cheese. For main, the Sea Venture special, shrimp, scallops, mussels, white fish and sausage in a delicious tomato broth. All of the seafood was cooked perfectly. There were lots of clearly labelled gluten free options on the menu too. A busy bar with a great atmosphere and cocktails. The seafood on the Californian coast is so good we had to have the ceviche which was fresh and flavourful. The chicken wings came with a delicious coconut curry sauce. We shared shrimp tacos and shredded pork tacos for main, all washed down with plenty of Hula's Mai Tais! If you've got time be sure to drop into Lilly Mae's in Monterey Bay for gluten free cinnamon rolls! Coming up - San Fran, Sonoma, Yosemite, Death Valley and Las Vegas! Your gluten free guide to Thailand! Do a cookery class or school. We did one called the Thai Farm Cookery School in Chiang Mai which was fantastic. You learn a lot of the common ingredients in Thai food and therefore what can be made gluten free. I didn't find the translation cards overly useful. They talk about wheat, barley and rye which isn't overly useful in Thailand. The most common things to avoid are soy sauce, oyster sauce and deep fried pastry type things like spring rolls. Everywhere we went understood my request for 'no soy sauce / no oyster sauce'. Better still we took our own in little plastic bottles. As everything is made from scratch most places were happy to use my gluten free versions even if they didn't quite understand why! Street food is delicious! Most places rinsed out woks etc. between dishes but you'd have to determine whether you thought that was safe for you. I never had any issues. Supermarkets can be a little tricky. It was very challenging to work out which crisps etc. were gluten free but eating out is so cheap and tasty we didn't need to use them much. Generally curries are gluten free - thai red, yellow, green, penang etc. Stir fries usually contain soy sauce and oyster sauce - either ask for without or take your own. Soups were generally gluten free e.g. tom yum. Rice and rice noodles are popular so you can always substitute any other type of noodle. Pad Thai is made with rice noodles but some add soy sauce, again just ask for it without. Desserts tended to be mango sticky rice or bananas in coconut milk which were both gluten free and delicious! Where we stayed - Hotel Muse - fantastic boutique style hotel with an infinity pool overlooking downtown Bangkok. Nahm - for an extra special Thai treat check out this Michelin starred restaurant. Thai food as you've never tasted before. Flavours are ramped up, presentation is spot on and the whole experience is spectacular. We went for the tasting menu and any dishes were modified seamlessly to be made gluten free. The soft shell crab was out of this world! Soul Food - trendy downtown restaurant which did Thai dishes with a twist. Dishes such as red curry with smoked duck and pork cheeks with green peppercorn curry provided a break from the usual. Staff were very clued up and the cocktails washed everything down very nicely. Street food off Koh San Road - first time braving a little cafe style place on the side of the road. Super cheap and tasty so we never looked back! Where we stayed - Anantara - amazing colonial style hotel looking out over the river. The food and drinks here were amazing too. Lemongrass - doesn't look much from the outside but this was a favourite of ours for lunch. Cheap but ridiculously tasty and they were more than happy to use my soy and oyster sauce to make delicious stir fries and pad thai. Washing it down with a cider was a treat too. Anusuan market - there's a whole host of fantastic street food places in this night market where we ate regularly. There's also a cool bar where local Thai bands play covers - don't miss it! Salsa Kitchen - if you need a break from Thai food this Mexican is great for gluten free options including a dedicated menu. Whole Earth Restaurant - Set in a traditional Thai house this has an Indian influenced menu common in northern Thailand. Tasty curries alongside classic Thai dishes in a beautiful setting. Where we stayed - Sareeraya - beautiful ocean front hotel in Chaweng Beach. Great food, cocktails and breakfasts. Only downside was they brought me gluten free bread every day which was like a rock! Full marks for effort though. Greenbird - has to be one of my favourites. Small place with plastic tables and chairs but incredible authentic Thai food and happy to use my soy and oyster sauce to make incredible dishes like the chilli chicken stir fry and sweet and sour. Brilliant service too, this became a regular lunch spot and we might have even gone twice in one day! There's loads of great places for seafood. They all do different offers - lobsters, prawns, crabs, squid etc. all BBQ'd on searing hot grills. In neighbouring Bophut we ate at an awesome steak place called the Shack run by an American and Irish guy where they imported Australian beef. For amazing sushi, check out Tai by Red Snapper. They make the most of the fantastic seafood available and were easily able to adapt dishes to ensure they were gluten free. It was an amazing trip with amazing food. If you're gluten free don't let that put you off, it's easy enough to navigate and you certainly won't be disappointed. Twenty-something foodie that’s been gluten free for the last couple of years. I enjoy nothing more than a good meal; whether in a Michelin starred restaurant in London, a café in a side street of Prague, cooked myself or prepared by my girlfriend. I love blogging and like hearing from you! Jamie Oliver's Chicken Satay in under 30 minutes?! Gluten Free McDonalds here in the UK?